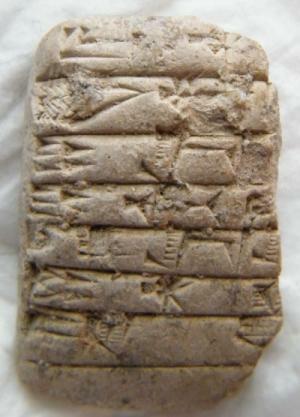 The 4000 year-old cuneiform tablet. An information technology academic's love of ancient languages and cultures has resulted in the preservation of a 4000 year-old artefact. Dr Larry Stillman, from the Caulfield School of Information Technology at Monash University, usually spends his time researching the social effects of IT in community organisations. His passion and original training however, is for the languages and cultures of ancient Mesopotamia which he studied for many years in Jerusalem and at Harvard University. Through his work in this area, Dr Stillman has come to own a tablet written in the ancient Sumerian language in cuneiform, a wedge shaped writing that was done with a stylus on soft clay. "I have deciphered the tablet, and it is one of the tens of thousands of receipts that were produced for the issue and delivery of goods to the great temples of what is known as the Third Dynasty of Ur," Dr Stillman said. "Unfortunately the tablet is too fragmentary to know what the delivery was for, but the names of the people involved are on the tablet. It was most likely for goods such as reeds." Dr Stillman's tablet was not left in the sun to dry, as was often the case, and had become very fragile over the years. "The only way to preserve it was to bake it. And to do this I enlisted the help of Brent King, from the Monash Caulfield glass workshop," Dr Stillman said. With instructions from the British Museum, which has the world's largest collection of tablets, Mr King put the tablet through its paces in the glass workshop kiln over several days. "It was a successful bake, and while the tablet is still delicate, it is now likely to last another 4000 years," Dr Stillman said. "It's certainly the oldest thing Mr King has ever handled, and is quite possibly the oldest document to ever grace the Caulfield campus." Dr Stillman is currently involved in work with a colleague at Hebrew University on cataloguing all the tablets in Australia and New Zealand. Dr Stillman would be very interested to hear from members of the community who might know of tablets in private or other collections which could become part of a scholarly contribution to knowledge about ancient Mesopotamia. He also has an informal group of reading texts in the Akkadian language which took over from the earlier Sumerian language, and is interested in recruiting others to learn what he describes as the most important world language before Latin.